In December 2005 we took our four month old baby on holiday to the Sherwood Forest Center parcs, Nottingham. We have visited several of the Center Parcs resorts in the UK (and one in the Netherlands), but this is the first time since we’ve had a baby. We went for a mid-week break at the start of the Christmas themed holidays. There are almost always some kind of offer available if you have a baby and should should try and get a discount code. One of the ones at the time was to quote “family” which gave a discount as long as you had a child under the age of 4 with you. Alternatively keep an eye out for offers on the Internet, in newspapers or in pregnancy and baby magazines. We arrived at about 12:00 noon, on Monday. The first problem was finding somewhere to park. The car park was completely full, and only after driving around for 10 minutes did we see some people getting ready to leave. They were in fact just getting their maps out to check for directions home, but left after about 5 minutes. I imagine that this was a busy time for the car parks as many of those that were due to leave after a weekend break hadn’t left, but many were already arriving for the mid-week break. Although access to the villas is restricted, guests are allowed access to the facilities earlier on their day of arrival, and continue to use them until later on the day of departure. After we’d finally got parked we headed in to the park and went to find somewhere for lunch. We’d already decided that we wanted to visit the pancake house at some point during our stay, so we headed straight towards that for lunch. The restaurant was fairly busy, but they did still have a table free. The food was good and not too expensive. The one issue we did have is that there is only one baby changing facility which is in the disabled toilet, and was very much in demand. Also the connector was missing on the strap, so it was not possible to secure our baby into the changer. I reported this on the comments form, so hopefully this will be fixed for future guests. We ate at two other restaurant whilst we were there. The first was Huckleberry’s. The food was fairly expensive, but no more than you’d expect from a good restaurant. Unfortunately the food wasn’t as good as you’d expect from a good restaurant. It wasn’t that the food was not nice, but just didn’t match the quality you’d expect for the price. One of the main attractions to center parcs is the swimming pool. The one at Sherwood Forest is one of the best “fun” swimming pools in the country. Including a wave machine, swim through rapids, flumes, tube ride and children’s areas. For babies there are special “Baby Dolphin” sessions. These are run in the mornings before the main pool opens (about 9:30), and include an opportunity to play with your baby in the main pool without any older children. It includes some inflatable toys to play with, and some children’s songs. There are quite a lot of family changing rooms, and we didn’t have problems finding any free during the baby dolphin sessions, but later in the day it was harder to find one that was free. We didn’t have to wait too long. As this was during the weeks coming up to Christmas there was a large advent calendar which was opened in the mornings, and visits to Santa available. The visit to Santa cost £7, which we thought was quite expensive at first. 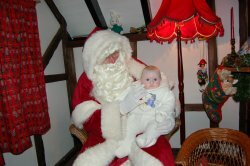 However it included a good quality toy (which is on sale at Mamas and Papas for £6.50 – reduced from £9), a photo and a reasonable length of time with Santa. It was a lot more special that some of the “conveyor belt Santas” that you get at some places. I also took my own camera in have some nice Christmas shots of our daughter with Santa. 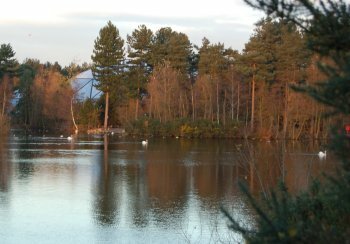 There is plenty to do at Center Parcs that it’s easy to have a whole holiday without ever leaving the site. 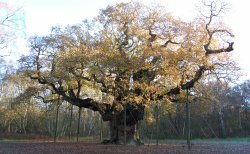 This time we did however take a trip out to visit the legendary Major Oak in Sherwood Forest. The visitors centre was only about 10 minutes drive away from center parcs, and had plenty of free parking (although they were putting barriers in, I think that these are to restrict access in the evening rather than to charge for parking). They did however have pay machines asking for donations towards the maintenance. There were a few shops and a small exhibition at the visitors centre and a “cheap and cheerful” cafe which served hot meals (quite nice and much cheaper than at Centre Parcs). The walk was about 20minutes to the Major Oak, which was very pleasant, and easy enough with a pushchair. The one thing that did let the centre down was that the only baby changing facility was in the ladies toilets. There was no where in the gents to change the baby. Even then the facility was near the doorway and so was very cold. This is not something you’d expect in a fairly modern facility. This entry was posted on Tuesday, February 7th, 2006 and is filed under Babies, General, Holiday, Tourism. You can follow any responses to this entry through the RSS 2.0 feed. Both comments and pings are currently closed.